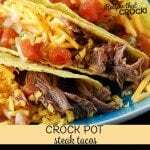 Delicious and simple Crock Pot Steak Tacos the entire family will love! This dump and go recipe produces tender shredded beef with savory Mexican inspired spices perfect for taco night! This recipe was originally found in Gooseberry Patch’s Everyday Slow Cooker. If you can't find flat iron steaks, you could use round steak or skirt steak. For these yummy Steak Tacos, I used my Hamilton Beach Programmable Insulated Slow Cooker. As always, clean up was a snap, and it cooked it to perfection! Your favorite 5-6 quart slow cooker would work as well. If you would like to serve up these check your tomato products for the lowest carb counts available and skip the hard taco shells. Instead, serve up as a yummy taco salad or in low carb tortillas.